The '20s may have been roaring for well-heeled urban centers, but on the farm? Rural electricity in the 1920s was as rare as Google Fiber is today. Which makes these 1922 predictions for the farm of the future so brazen. Last week, you may have seen this awesome 1921 map from the Star Tribune archives. It shows which states in the U.S. had the most household users of electricity, with places like New York and Illinois visually swollen to represent their large (newly electrified) urban populations. The previous year, in 1920, the U.S. Census found for the first time in its history that America was majority urban. Which is to say that America now had over 50 percent of its population living in cities rather than rural communities. In 1920, just 35 percent of American households had electricity. By 1929, nearly 68 percent of American homes were electrified. But, if you don't count farms, about 85 percent of Americans had electricity by the end of the 1920s. And there's the rub. Rural communities, including farms, were far slower in adopting electricity than the rest of the country. Of the roughly 6.3 million American farms in 1922, only about 3% had electricity. It wasn't until 1935 that the U.S. government addressed this huge rural vs urban electric divide with the formation of the Rural Electrification Administration. But in 1922 (when so few rural places had electricity), Science and Invention magazine featured their vision of the farm of tomorrow—the Electric Farm de Luxe! The farm of the future is in many ways trying to reflect the rapid adoption of tech at the time, found primarily in large American cities. People in urban areas couldn't get enough of the latest electrified gadgets, including electric lamps, dishwashing machines and this amazing new invention called the wireless telephone-or radio, as we call it today. And fueled by a boomtime economy and easy credit (something that would come back to haunt the nation at the end of the 1920s) these sleek modern devices were spreading like wildfire. They were just slow to find their way to the farm. According to the magazine, the farm house of the future has modern conveniences like electric refrigeration. To put in perspective just how futuristic this idea was, only 8 percent of American homes (both rural and urban) had a mechanical refrigerator in 1930—eight years after this illustration was published! Electric refrigeration was virtually nonexistent at the start of the 1920s. These include the usual kitchen and living room appurtenances, such as electric clothes washer, lights, fans, food chopper, dish washer, sad irons, table cooking utensils, such as chafing dish, coffee percolator, toaster, etc. In the more pretentious electric farmhouse, we often find an automatic electric water-pump and storage tank system, using compressed air to force the water up thru the various rooms with one or more bathrooms, as well as an electric refrigerator in the kitchen, a small motor working periodically and automatically as required, a pump connected with an ethyl-chloride circulating and condensing system for the refrigeration in question. 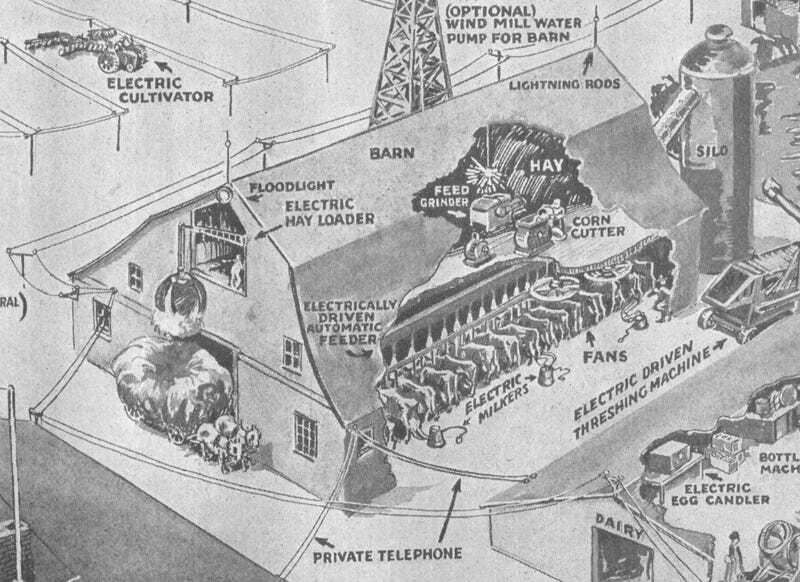 The farm of the future also had an electric incubator. What's interesting to note is that modern chicken farming techniques that we see on the conventional farms of today wouldn't become popular until the late 1930s, so this farm of the future still had chickens pecking about in what today we might call "free range" conditions. Raising chickens in the future would be automated, the magazine promised, with increased exposure to artificial light being crucial to their development. One of the most important things that electricity has done for chicken raising is the lengthening of the short winter days, by lighting the hennery up to about 9.00 o'clock at night. The simplest way to arrange for the lights to flash on at sunset and cut them off at the desired hour, is by means of an electric time switch, several forms of which are available from electric contracting and supply houses. A farmer who wishes to electrify on a small scale, can do so in one of several ways, and at a reasonable cost at that. He has the coice of at least three tried and proved methods of generating his own electric current, viz. 1 — by using a water wheel or turbine to drive the dynamo; 2 — by utilizing a wind-mill driven dynamo; 3 — by employing a gasoline engine driven dynamo. Just two years later, a sister publication of Science and Invention called Practical Electrics would feature instructions on how to make your own power plant in a stream on your property. Cutting down trees as well as planting and cultivating crops were all jobs that would benefit from the electrification of the American farm. But it was the automation of milking that seemed to show the most promise for the electric farm of tomorrow. "Miss Electricity" is Queen of all she surveys in many modern dairies, especially those of large size. Here we find electric motor-driven cream separators, bottle washing and filling machines, butter churns, electric egg candlers, for testing the quality of eggs (altho these devices are sometimes placed in an egg sorting and packing room attached tot he hennery). An electric ice machine for the dairy is practical, and no doubt, when electricity become more well-known on our farms, this feature will be utilized to a very considerable extent, as the cost of ice when it has to be purchased, has been increasing each year. Despite all the promises of Science and Invention, electricity was indeed very slow to reach the farm—even during the boom economy of the 1920s. By the end of the 1930, electricity found its way to only about 10 percent of American farms. And while electric tractors powered by nearby streams may have never become a common sight, the electrification of the American farm no doubt contributed to tremendous growth and increased crop yields during World War II.